These spirals can handle a variety of load sizes, big and small with their 30′ wide slats. The Wide Trak Spirals can handle double the weight capacity of our standard spirals, and can provide an elevation change of up to 50 feet with only one drive. They are ideal for warehousing and order picking operations. The Ryson Narrow Trak Spirals are great space savers with high throughput that can run at speeds in excess of 200 fpm. They are also a good alternative to side gripper conveyors because they can run at high speeds and do not need to be adjusted for varying product sizes. The Narrow Trak Spirals are especially beneficial for the food, beverage, pharmaceutical, nutraceutical, personal care market and food product companies. The latest version of the Garvey Infinity Loop integrates two Ryson Mass Flow Spiral Conveyors enabling the use of available vertical space to increase system capacity within a small footprint. 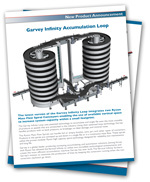 Garvey is a global leader producing conveying, accumulating, and automation solutions. Joining forces with Ryson has allowed the Vertical Infinity to utilize two incredible technological achievements and create the most efficient accumulation machine Garvey has ever built. The Vertical Infinity furthers Garvey’s mission to maximize the production of lines by keeping the constraint running when the non constraint machine’s go down. The Ryson Mass Flow Spirals are designed to handle full and empty bottles, cans, jars and similar containers. Products are conveyed up or down in a continuous mass flow. Ryson’s Vertical Spiral Conveyors showcased on Ultimate Factories during the packaging process of bottle and can lines. Ryson International was recently featured on “Ultimate Factories,” a hit series on the National Geographic Channel. The March 17, 2011 episode of Ultimate Factories highlighted a Coca-Cola bottling plant in Baton Rouge, LA, that has been in operation since 2009. The new High Capacity Spirals are in response to our customers need for taller units and to handle heavier loads. Both are factors which increase the total weight present in the spiral at any given time. The new spirals can start and stop fully loaded and handle double the total weight compared to our regular spirals. The new Ryson Dual Track Spirals are the ultimate in space savings. Two tracks operate within onespiral structure. Both tracks can go up or down, and can optionally be reversible.